Hemporium hosted the latest in our hemp awareness evenings last week. This time we deconstructed the fascinating field of building with hemp. South Africa’s foremost hemp expert, Tony Budden knows what it’s like to live in a hemp house. He has lived in South Africa’s first hemp house since it was built in 2011. Tony shared his personal experience and knowledge from his involvement in several local hemp building projects and visits with international leaders in hemp building. Wolf of Wolf and Wolf Architects has designed & facilitated almost all of the Western Cape’s hemp building projects to date. Wolf answered some of the audience’s more technical questions and shared some of his valuable insights. We were also treated to an appearance from a very special guest: Mama Mickey of Yiza Ekahaya. Yiza Ekhaya is a soup kitchen in the informal settlement of Khayelitsha in Cape Town. Mickey feeds and cares for over 250 people daily, funded entirely on donations and her own state pension. In 2015 teams from Greenhome, Wolf and Wolf Architects, and Hemporium joined forces to build a hemp extension to the soup kitchen’s premises. 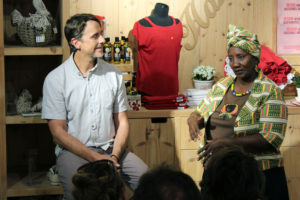 Mickey shared her experiences of hosting HIV awareness and permaculture workshops in the hemp building. Mickey also noted how she is having great success improving wellness in the area with hemp seed oil. We covered several topics, including the process and mixture used in building with hemp. Attendees learned about the many environmental & practical benefits of the exciting building method. The audience also discovered the details of the Western Cape’s current hemp building landscape. View short video snippets of the event here. Please let us know in the comments if you have any questions or feedback. Are you dreaming of building with hemp? Order hemp building materials here. Keep an eye on our Facebook page for more events coming soon!